Three sequels to a film that arguably doesn’t even need one, none of which he’s even begun to shoot yet. This will fill up his directorial quota until at least 2018, but if past experience tells us anything, it’s that even if Avatar 4 avoids delays it will be years before the long-awaited Battle Angel (which many of us hoped would follow Avatar) or, indeed, anything else, will hit our screens. Remember the twelve-year gap between Titanic and Avatar? And this is all assuming, probably incorrectly, that he won’t just decide to do Avatar 5. At the end of the day it’s up to Cameron how he wants to spend his time, and it’s up to us as viewers to respect that. After all, he did treat us just a bit in the past, and we’ve always got those older films to look back on and enjoy time and time again, as I did just a few nights ago with the brilliant and timeless Terminator 2: Judgement Day. A question, as it always does, struck me while watching it that has torn me for years: is Judgement Day better than The Terminator? That one’s harder to answer than Alien or Aliens (Aliens is more entertaining, Alien is the better film). But I’ve always been on the fence with this one…until this latest viewing which, for whatever reason, yielded a decisive answer. Judgement Day is the better film. Judgement Day is, possibly, the best sequel ever made. What really sets it apart from most action movies is a script which devotes so much time to developing characters who we relate to, care about and root for. As good as the first Terminator is, what it lacks – at least in quantity – is that sheer depth and characterization. The relationship that blossoms between Sarah and Kyle is, indeed, one we lose ourselves in (and offers an interesting slant to the story by revealing that Kyle, the man John sent back to protect his mother, is actually his father), and Sarah in general is a strong and well-written female lead, yet it has nothing on the relationship between young John Connor and the T-800 101. Judgement Day not only further evolves Sarah’s transformation from waitress to fighter as her determination to prevent the rise of the machines borders on the psychotic, but it develops John from a rambunctious, fight-the-establishment teen to a young man learning the values of camaraderie and leadership through the idea of machines learning to feel. As Sarah evaluates in one of her voice-overs, the T-800 begins to act like a father-figure to John, the guardian he never had, learning along the way how to talk like a human (“Hasta la vista, baby”), how to smile, why not to kill, and why we cry. In turn this highlights human flaws in the T-800, thinning the line between man and machine. It should never have allowed itself to become attached to John; or more accurately, should never have allowed John to become attached to it, as evident in the finale when John, knowing he can control the Terminator, demands it not to destroy itself (if it had obeyed it could have brought about the war, rendering everything they achieved in the film pointless). 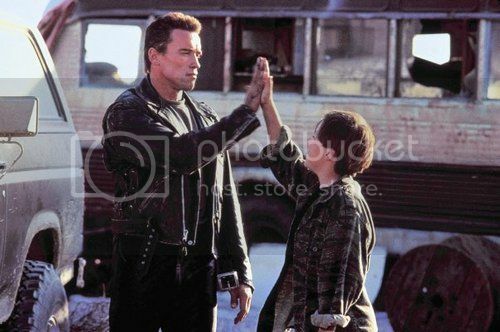 The T-800 doesn’t oblige, leading to the eye-watering ‘thumbs up’ ending as another father leaves John, but it could have gone the other way. And that’s the important word: when feelings take over from logic and science, uncertainty rears its head. Where before the Terminator was a stone-faced, emotionless killing machine, we now see that it has the capacity to think and feel – to become a fully sentient being, for better and for worse. A powerful idea within the boundaries of the story, but it comes with ominous undertones. Yet that’s not all Judgement Day has to offer. The depth of these ideas is merely what adds power to excitement, because as an action film it’s easily one of the best. The truck/bike chase in the storm drains, the shopping mall shootout, the police attack on the building and subsequent escape, and pretty much every time the T-1000 appears, make this one of the most thrilling rides out there. 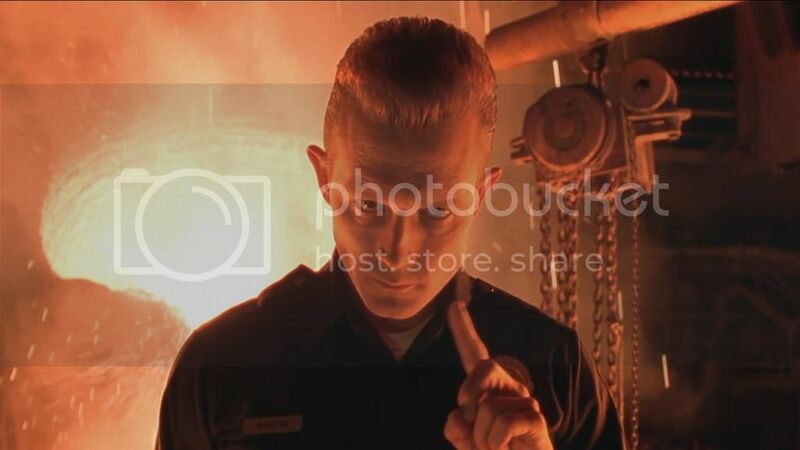 That T-1000, a new liquid metal terminator that’s more powerful than any we’ve seen before, is one of the best villains ever committed to the screen. The sheer indestructible nature of the thing; its determination, relentlessness, ability to drift through objects, shape-shift into other people and make you wet yourself, makes it the über terminator. Perhaps Terminator 3‘s even further improved T-X model is more powerful, with the same liquid metal exterior over an exoskeleton with built-in weapons and the ability to remotely control machines, but Robert Patrick’s stone-cold performance will always make his T-1000 the best of the bunch. Cameron must have asked himself when he sat down to write Judgement Day: “How do I write a better villain than last time?” Clearly, he answered it. The only real issue with Judgement Day, if it can be called an issue, are the plot holes inherent with a time travelling narrative. Every time travel movie has one somewhere, some sneaky little idea or piece of information that doesn’t add up, because time travel is one of the most mind-bending theories ever conceived (and it’s hard enough piecing together a coherent narrative as it is). In Judgement Day‘s case, it inevitably asks the question of, instead of protecting Sarah Connor, why didn’t the humans just send a terminator back to kill Miles Dyson before he could complete his work which led to the creation of Skynet? In one scene, the T-800 even says, “You know by killing Dyson we could actually prevent the war.” Of course that leads into the old moral conundrum; can you sacrifice one for the longevity of many? I think in this case you probably could. Likewise, it also serves up something of a paradox: it’s explained in the film that Dyson’s breakthrough in his research came when he found the broken terminator parts (from the T-800 in the first film), which means that he would never have created Skynet without a terminator, but terminators wouldn’t exist without him creating Skynet… I guess it’s no less confusing than Kyle Reese being John Connor’s dad. Because Judgement Day has just creeped into my top ten films of all time – a fickle list if there ever was one – I felt it needed some fresh recognition; a reminder of why it ticks all the right boxes. It’s a film that combines the best of everything: thrilling action, inventive ideas, a compelling plot, emotionally powerful story arcs, strong character development, a prophetic narrative… Everything you could want crammed into a short two and a half hours. The Terminator franchise as a whole continues to hold up after all these years – even the maligned Rise Of The Machines has a lot more going for it than many people give it credit for, but Judgement Day is officially and unequivocally the best of the lot. It’s a stunning film. Perhaps, in the end, there’s a silver lining for Avatar 2. James Cameron has already made two of the best sequels the world has seen (the other being Aliens), can he make it a hat-trick?